I’ll start by saying that I have never been a fan of modern horror in any form of media, be it book, film or other. I do enjoy a few of the horror movies of old, those that were more psychological thrillers with a monster as the antagonist instead of a human. One could easily swap the monster out with a very evil human and you’d have just as good a movie. In fact, some of those old movies had just that, as in The Wax Museum starring Vincent Price. 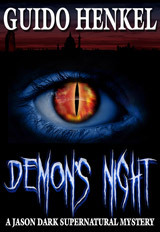 With that out of the way, I will say that I thoroughly enjoyed reading the first book in the Jason dark series, Demon’s Night, by Guido Henkel. The book is described as “gothic horror”, which originally turned me off. But after reading some of the reviews, I started getting the feeling that there was more to these stories. I purchased Demon’s Night and read it in one sitting. I would categorize this as a paranormal thriller. It’s like Sherlock Holmes with demons. And that is a genre I do enjoy. What hooked me most was the richness of the setting. Guido does a fine job of dropping the reader into late 19th century London. Considering the length of the story, the characters are nicely developed as are their relationships, all of which add to the richness of the “period” of the story. There are no chapters, and sometimes the breaks seem to interrupt the flow of the story, though the events always tie back in. The story is short and entertaining, and I was left wanting to know more about the characters and their world. I will definitely be picking up book two, “Theater of Vampires”, to see how the tale of Jason Dark continues.